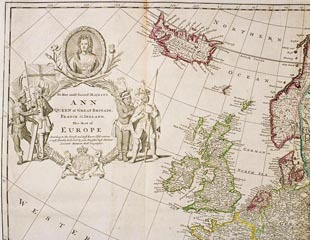 This cartouche from Moll's map of Europe shows the British royal arms and figures representing America, Britain, Africa and Asia. It neatly encapsulates the close relationship between commerce, empire and the development of an inclusive sense of Britishness. This map comes from a collection by the Dutchman Herman Moll. By the turn of the eighteenth century Moll was the most prominent map publisher in England. He moved in cosmopolitan circles and counted among his friends Daniel Defoe, Jonathan Swift (he provided maps for Robinson Crusoe and for Gulliver's Travels), and the explorer William Dampier. This coin shows the national emblems of England, Scotland and Ireland united under the authority of the new Hanoverian dynasty. The fact that the monarch retained a nominal claim over the French throne explains the inclusion of the fleur-de-lis. It took at least three decades after 1707 for the Union to win widespread acceptance in Scotland. A combination of political, economic, religious and cultural factors slowly helped to cement the authority and popularity of the new British state. Economics were important in the Union's increasing appeal to the Scots. Gaining access to England's markets and overseas colonies was one of the key benefits of the 1707 agreement, and helped unite the kingdoms by providing opportunities and profits for Scots of all social backgrounds. England now offered a secure and expanding market for Scottish cattle and linen. By the 1720s Glasgow and the other Clyde ports were beginning to profit from the transatlantic tobacco and sugar trades. Meanwhile in Asia, Scots were increasingly employed as merchants, doctors and soldiers in the service of the English East India Company.